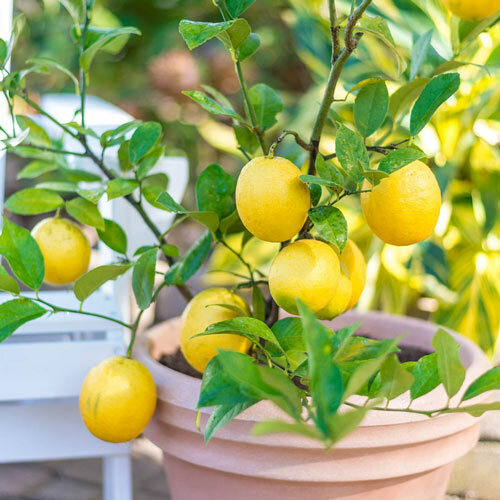 You'll love this variety specifically because it's fruit is some of the most delicious—it is the variety of lemon chefs tend to prefer, because its sweeter than classic grocery store lemons, with a slight hint of tangerine. The nice, healthy roots in either of our two sizes—a 2" and a 2 qt. pot—will be all set for a great performance in your home or on your porch. In either size, it'll take a few seasons before it starts producing fruit, but its shiny leaves are pretty from the word go. Sweetly fragrant flowers join in soon after and bring a lovely, refreshing citrus scent to your home twice per year. Once the fruit gets going, it becomes incredibly prolific, and will eventually give you lemons year-round. It grows slowly, which is a good trait for growing indoors, because you'll be able to manage it easily. Just be sure, if you're pruning, not to prune more than a third of the tree in a single year. This citrus tree is only winter hardy in zones 9-11, so it'll need to be indoors at least in the cold months in most climates. If you keep it indoors all through the year, you'll have to play bumblebee and pollinate the blooms. Take a paintbrush and brush the pollen grains onto the stigma (the sticky part on the lemon bloom). Foliage TypeOval to oblong dark green alternate leaves, fragrant. Flower FormSmall, 4 petaled, complete. Planting InstructionsIn containers, use a water retentive soil-less media that has good water holding capacity. Vigorous grower that requires good fertilization practices and ample amounts of water to produce fruit year round. Foliage TypeGlossy, dark green evergreen leaves are. Flower FormWaxy, fragrant, white flowers. 3" diameter of round smooth thin skin of yellow fruit. Winter CareWinter hardy zones 9-11. Northern zones plant in a container as a houseplant. Set container outdoors in late spring in full sun. Indoor plants will bear fruit in the spring. FruitLight yellow-orange colored, thin skinned lemon. Planting InstructionsIn containers, use a water retentive soil-less media that has good water holding capacity. Should be set at same level as when it was shipped. Vigorous grower that requires good fertilization practices and ample amounts of water to produce fruit year round.